Bulk Invoicing allows you to perform certain actions on multiple invoices at once saving you time and effort. Currently you can email invoices, send confirmations, add manual payments (i.e cash/check) and charge (only available if credit card processing is enabled on your account) invoices in bulk. To access bulk invoicing visit your Dashboard. Using the left sidebar find and click on the Invoicing option. Click on the “Bulk Invoicing” link. By default the bulk invoicing page shows invoices with a due date set to the current day and a status of “Not Fully Paid”. You can adjust these filters to find the exact invoices you want to perform a bulk action on. Any Due Date: Due Date is not taken into consideration when filtering invoices. All due dates are included. Due Date Before: Find all invoices with a due date before the specified date. Due Date After: Find all invoices with a due date after the specified date. Due Date Is: Find invoices with a due date on the specified date. Due Date Between: Find invoices with a due date between the two specified dates (dates are inclusive). Any Invoice Date: Invoice Date is not taken into consideration when filtering invoices. All invoice dates are included. Invoice Date Before: Find all invoices with an invoice date before the specified date. Invoice Date After: Find all invoices with an invoice date after the specified date. Invoice Date Is: Find invoices with an invoice date on the specified date. Invoice Date Between: Find invoices with an invoice date between the two specified dates (dates are inclusive). First Visit Before: Find invoices with an invoice date with a first visit before the specified date. First Visit After: Find invoices with an invoice date with a first visit after the specified date. First Visit On: Find invoices with an invoice date with a first visit on the specified date. First Visit Between: Find invoices with an invoice date with a first visit between the specified dates. Last Visit Before: Find invoices with an invoice date with a last visit before the specified date. Last Visit After: Find invoices with an invoice date with a last visit after the specified date. Last Visit On: Find invoices with an invoice date with a last visit on the specified date. Last Visit Between: Find invoices with an invoice date with a last visit between the specified dates. Any: Status is not taken into consideration when filtering. All statuses will be returned. Not Fully Paid: Only invoices that have not received full payment. Past Due: Only invoices that are past due. Any: Whether an invoice has been emailed to the client is not taken consideration when filtering. All invoices that have been emailed and all invoices that have not been emailed are included. Not Sent: Only invoices that have never been emailed to the client. Sent: Only invoices that have been emailed to the client. Any: Whether a confirmation of the services on the invoice has been emailed to the client is not taken consideration when filtering. All invoices that have had confirmations sent and all invoices that have not had confirmations sent are included. Not Sent: Only invoices that have never had a confirmation emailed to the client. Sent: Only invoices that have had a confirmation emailed to the client. Once you have updated the filtering options be sure to click the “Search Invoices” to update the results. Once you have found the invoices to perform bulk operations on you need to select them. Next to each row there is a checkbox. To include an invoice click on the checkbox, you will notice the row also turns green indicating that this invoice will be included. 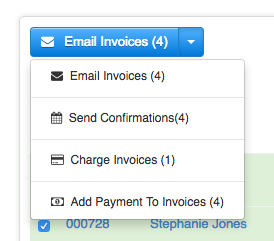 To check/uncheck all rows scroll to the bottom of the invoices list and click the "Check All/None" button. Once you have selected the invoices you want to perform a bulk action on, use the blue action button above the selected Invoices. Click the arrow to the right of the button to get a list of all available actions. You will notice that each action has a number in parenthesis at the end. This number represents how many invoices this action will be performed on. Bulk charging of invoices is only available if you have credit card processing enabled and the invoice’s client has at least one payment method on file. When ready, click the respective action. You will be presented with a new window asking you to verify you want to perform the action. Click to verify, and the bulk invoicing action will be performed. It is important to check the status of each bulk action. Since the bulk actions are being performed in the background on many different invoices we can’t alert you right away if there is an issue. For example, if the credit card on file for a client has expired the charge will be declined. This will not affect the other invoices in the batch however.